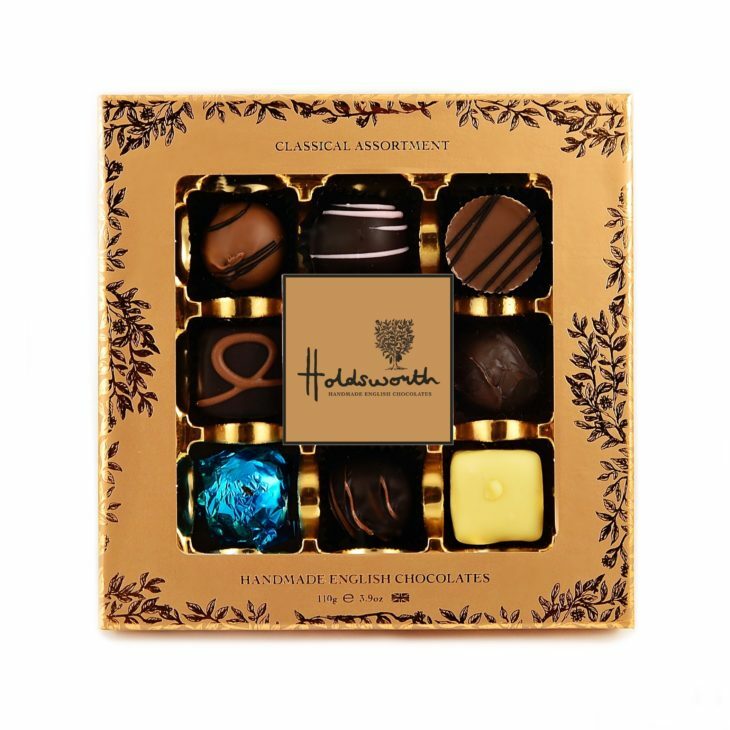 Give your senses a treat with this gorgeous collection of assorted chocolates, beautifully presented in a stunning gold window box. Discover a decadent Crème de Cacao Truffle, a mouthwatering Strawberry Cream, a nutty Hazelnut Praline and more. 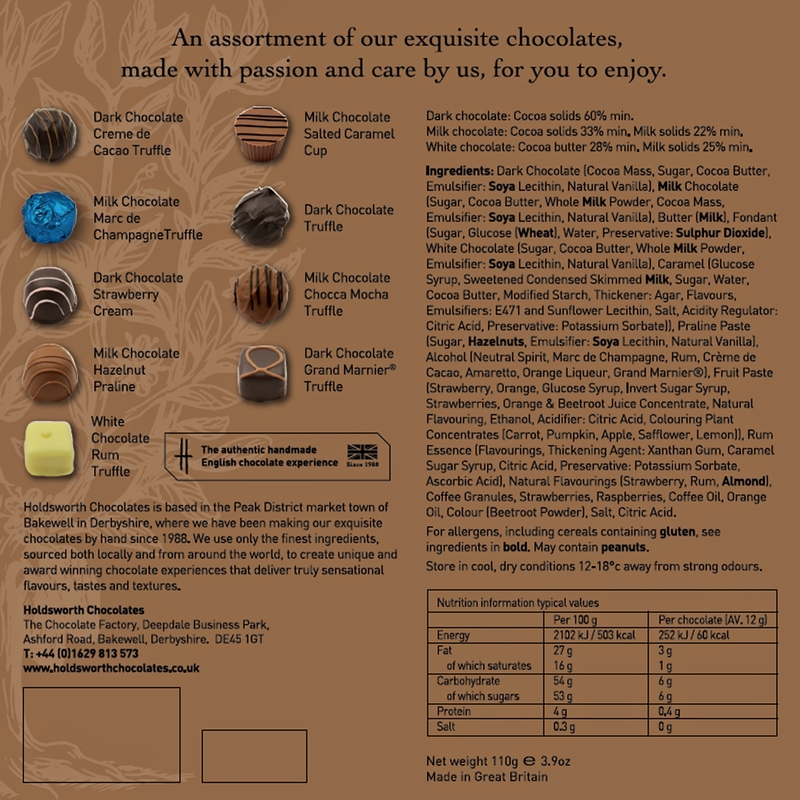 Ingredients: Dark Chocolate (Cocoa Mass, Sugar, Cocoa Butter, Emulsifier: Soya Lecithin, Natural Vanilla), Milk Chocolate (Sugar, Cocoa Butter, Whole Milk Powder, Cocoa Mass, Emulsifier: Soya Lecithin, Natural Vanilla), Butter (Milk), Fondant (Sugar, Glucose (Wheat), Water, Preservative: Sulphur Dioxide), White Chocolate (Sugar, Cocoa Butter, Whole Milk Powder, Emulsifier: Soya Lecithin, Natural Vanilla), Caramel (Glucose Syrup, Sweetened Condensed Skimmed Milk, Sugar, Water, Cocoa Butter, Modified Starch, Thickener: Agar, Flavours, Emulsifier: E471-Sunflower Lecithin, Salt, Acidity Regulator: Citric Acid, Preservative: Potassium Sorbate), Praline Paste (Sugar, Hazelnuts, Emulsifier: Soya Lecithin, Natural Vanilla), Alcohol (Neutral Spirit, Marc de Champagne, Rum, Crème de Cacao, Amaretto, Orange Liqueur, Grand Marnier®), Fruit Paste (Strawberry, Orange, Glucose Syrup, Invert Sugar Syrup, Strawberries, Orange & Beetroot Juice Concentrate, Natural Flavouring, Ethanol, Acidifier: Citric Acid, Colouring Plant Concentrates (Carrot, Pumpkin, Apple, Safflower, Lemon)), Rum Essence (Flavourings, Thickening Agent: Xanthan Gum, Caramel Sugar Syrup, Citric Acid, Preservative: Potassium Sorbate, Ascorbic Acid), Natural Flavourings (Strawberry, Rum, Almond), Coffee Granules, Strawberries, Raspberries, Coffee Oil, Orange Oil, Colour (Beetroot Powder), Salt, Citric Acid. 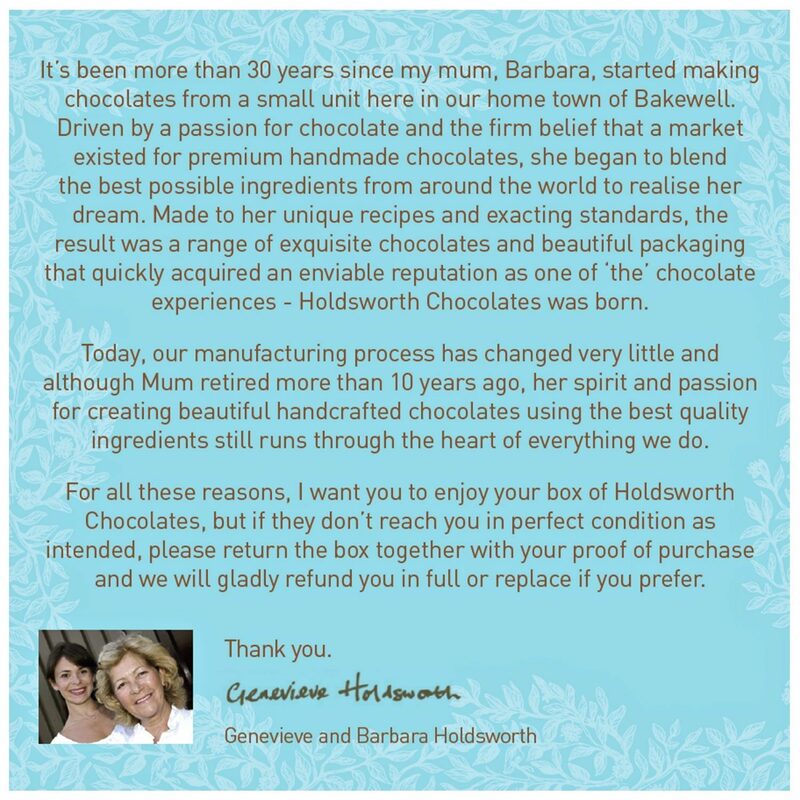 chocolates that actually taste of chocolate – well done Holdsworth. This box brought back the joy I felt in my youth when presented with an assorted box of chocolate. It proves that Cadbury, Rowntree, Nestle and Thornton’s are lieing to its customers when they insist it is consumer ageging taste buds that have changed and not their recipes.